Stained Glass Art is my favorite medium. Glass comes in a constellation of colors and textures, and like the ocean, changes mood with the light. 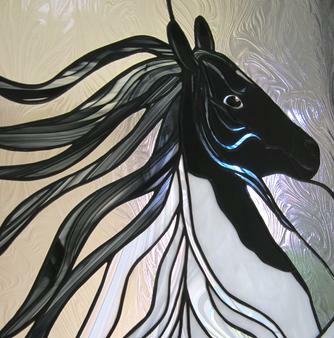 I utilize the intensity of stained glass to create vibrant one-of-a-kind custom works of art. 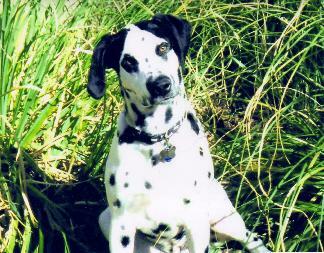 Clients can participate in the creation or provide a treasured picture of a pet and watch it come to life in glass. 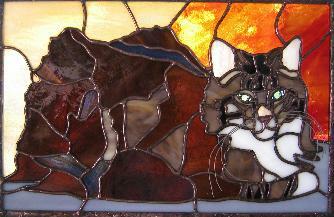 It is my objective to capture a client’s memories and the animal’s essence in the art of stained glass. For more information on my artwork click on the link to the featured article in the Las Vegas Sun Newspaper. or watch the video on my recent Exhibit at the Summerlin Library Gallery. 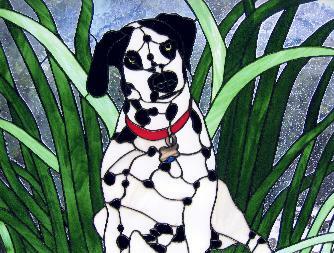 I created this hanging stained glass panel of my beloved Dalmatian, “Orbit” from his photo to capture his markings and his personality. This type of “hanging” panel provides flexibility as it can be moved…i.e., it is not permanently installed in a window or door. 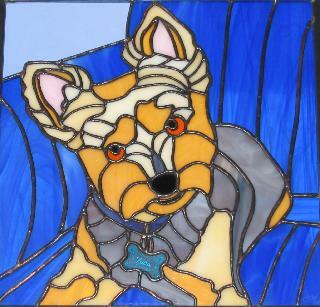 I can create a hanging stained glass panel of your pet so your glass art piece of your loved one can go with you where ever life leads you! 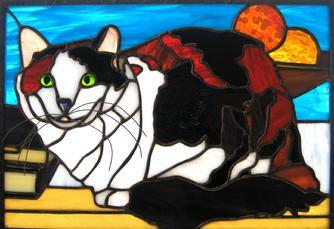 This stained glass panel is commission piece of a cat named “Mandella”. I created him from a picture of a client’s favorite cat. She didn’t want the window to be to big… 8 inches high by 11 inches wide, with more than 100 pieces of glass!! 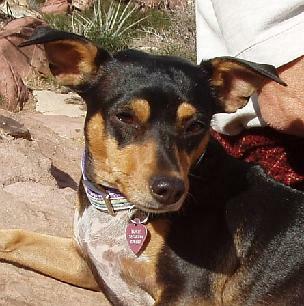 The stained glass window is lit in a cabinet to honor her best friend, “Mandella”. “Harley” is a custom 32 3/4″ x 27 1/4″ hanging stained glass panel I was commissioned to design & create as a surprise for my client’s wife for Christmas. He was so excited to give it to her that he surprised her early and hung it in her bathroom, so when she came home from work, it would be the first thing she saw. 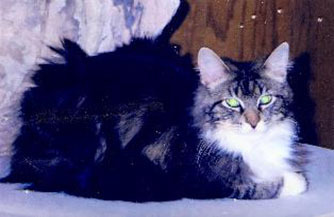 My client shared with me that when she saw it from afar, she knew immediately it was “Harley”. 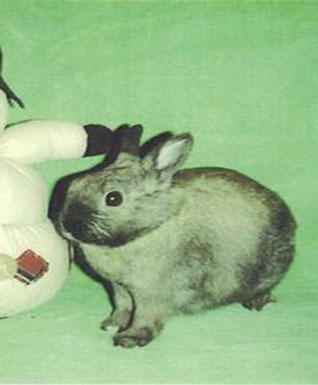 “Harley” was his wife’s most cherished beloved dwarf rabbit. She said that I brought out an essence of Harley that even photos never could and will treasure it forever. Harley was displayed in the “Gallery of Excellence” at the 2010 Glass & Bead Expo in Las Vegas, Nevada. 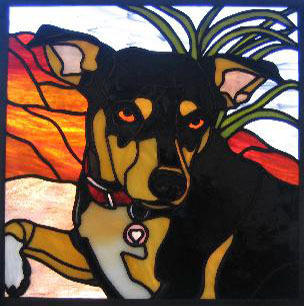 I designed this stained glass panel of “Peaches” to compliment the client’s stained glass panel I created of “Mandella” above. Again, my client didn’t want the window to be to big… just 7 inches high by 10 1/2 inches wide to display in the matching curio cabinet across from where the stained glass panel of “Mandella” resides. 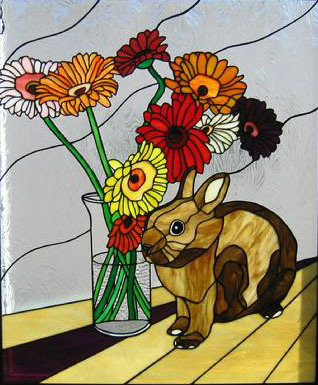 The piece of “Peaches” includes 92 pieces of glass and 20 colors & textures of glass to captured her lively personality! 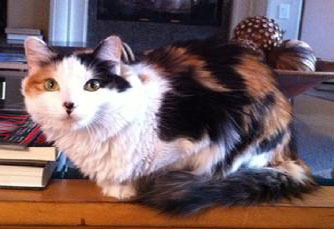 The client was so happy to have both of her favorite cats, the beloved “Mandella” and her current feisty one “Peaches” preserved in glass! I designed this commissioned stained glass panel of “Yoda” as a surprise birthday gift for the mother of a client who cherishes her Yorkie beyond what words can describe. 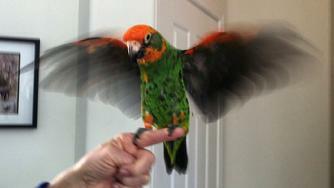 It is a hanging 10″ x 10″ panel that be placed in any window location she choses! 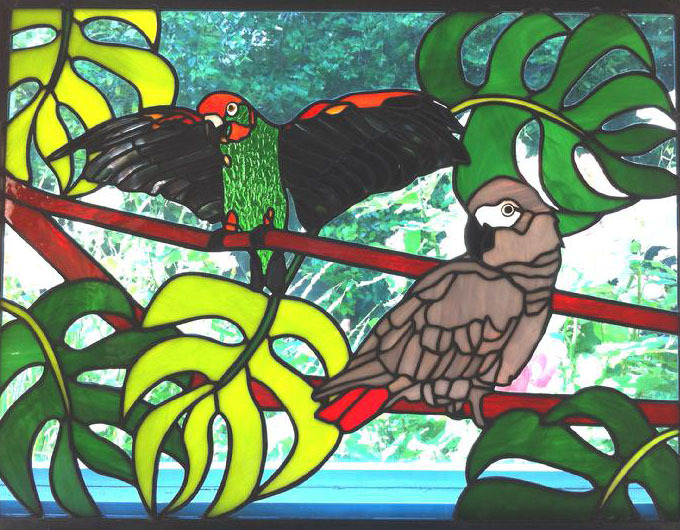 Since my client & dear friend loved the stained glass panel of “Oreo” above, she wanted me to created a hanging stained glass panel for her living room window that captured the different personalities of her two cherished birds, Jay & Cookie. 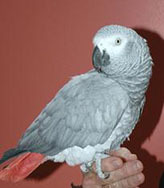 They are night & day different in temperament, size and species. I designed this 16″ x 21″ panel to bring out all these characteristics and place them in a natural setting. She was just thrilled!!! She says their eyes follow her were ever she goes and I captured them perfectly!! 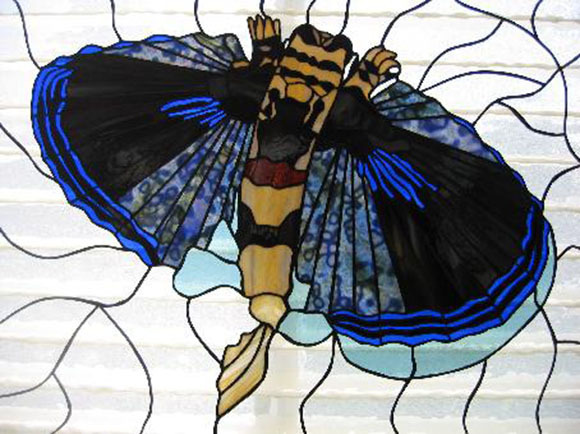 This original stained glass panel is of a “Flying Gurnard”. I photographed this unique fish underwater off the coast of Bonaire and created it in stained glass! It consist of 250 pieces of glass and changes hue over the course day and night. The piece is included as part of my Exhibit at the Enterprise Library Gallery in Las Vegas, Nevada, 9/15/09-11/15/09. 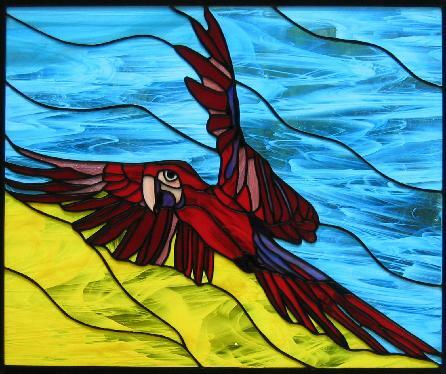 I was commissioned to create a stained glass window for a client’s office of a Red Bird, representing upward growth and expansion. This window is an interior piece, so I designed a light box to illuminate the Red Bird named “Polly”. It is mounted to the wall and can be seen the minute anyone walks in the door!